Extracts of the medicinal herb rhodiola rosea have been used historically to boost stamina, mood and mental function. According to Dr. Andrew Weil, a naturopathic physician, studies increasingly suggest that this versatile herb can help treat a variety of common conditions. Though rhodiola extract is associated with few side effects when it is used correctly, it may cause adverse effects. 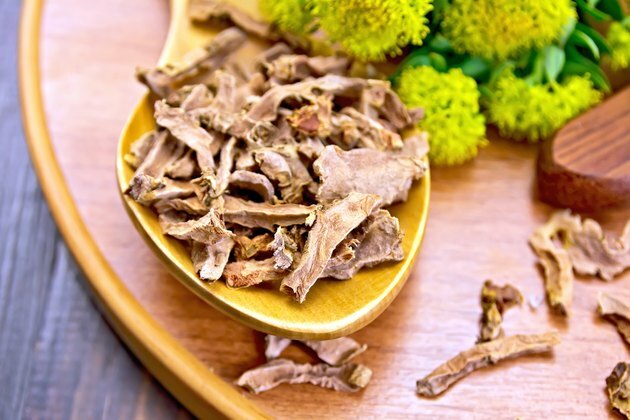 Consult a qualified practitioner before taking rhodiola extract, particularly if you have a medical condition. A small-scale clinical trial at the University of California, published in 2008, demonstrated that dry mouth is a common side effect of rhodiola extract. This side effect, known to the medical community as xerostomia, can cause complications such as tooth decay and digestive problems if left untreated. Sugarless candy, additional fluids and alcohol-free mouthwash can help mitigate this uncomfortable side effect. Consult your health care provider if it persists. Although Dr. Weil regards rhodiola extract as a potential treatment for cardiovascular conditions, naturopath Ray Sahelian warns that it may cause unanticipated changes in blood pressure. Low doses of rhodiola can help reduce blood pressure, whereas higher doses tend to elevate it. Until further scientific investigations have determined rhodiola's exact effects on blood pressure, people with hypotension or hypertension should use it only under a physician's direction. Blood pressure fluctuations from rhodiola extract may cause dizziness or vertigo. The authors of the University of California rhodiola study determined that the supplement could cause dizziness in some susceptible people. Seek emergency medical treatment if you experience dizziness accompanied by blurred vision, chest pain or blackouts. These accompanying symptoms may indicate the presence of a serious medical problem. Although at least one pilot study has suggested rhodiola extract's efficacy as an anxiety treatment, its stimulating effects may actually worsen anxiety disorders. Dr. Ray Sahelian warns that rhodiola rosea can cause or worsen anxiety symptoms such as restlessness, irritability, tachycardia, panic and mood swings. These problems may be most pronounced in people who are sensitive to stimulants such as caffeine and yohimbine. Avoid taking rhodiola near bedtime, since it may worsen anxiety-related insomnia. Dr. Andrew Weil- Rhodiola for What Ails You?